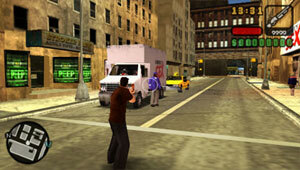 The targeting system in GTA Liberty City Stories is an improved version of the one we saw in GTA San Andreas. Infact, you could say that this is the best targeting system any Grand Theft Auto game has seen. Press the right shoulder button (R) to lock onto targets using the new 'priority over proximity' system, where the nearest threat is targeted instead of innocent pedestrians. Once locked on, use the left and right Dpad buttons to target other threats. This new system allows Toni to cap his enemies in rapid succession. 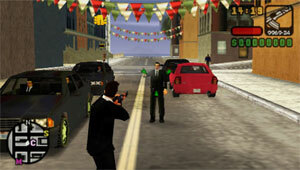 As with previous titles in the GTA3 trilogy, free aim is an option. Press the R button to draw your weapon and then press Down on the Dpad to switch to free aim. This is particularly useful for taking out car tires or shooting explosive barrels. There is also the ability to slow down the rate at which the reticule moves across the screen. Press the left shoulder button (L) whilst in free-aim mode and the speed drops significantly to allow for more accurate shooting. Liberty City Stories also allows you to customize your button layout, so you can perform drive-by shootings using the L and R buttons or by using the analog stick to look left and right. You can purchase firearms at various Ammu-Nation's scattered across the city and also at "Phil Cassidy's Fully Crooked" weapon service. A wide range of weapons are available at both services. Visit AmmuNation.net for more info. While not used as an implement of destruction directly, the photos they produce have been instrumental in many a Liberty City politico�s ultimate downfall. Cameras have been found all around town loaded with film of scandals, robberies and murder. Having put their time in various prisons to good use, it seems that the criminal element of Liberty City have begun popularizing the use of chisels to shank their victims. Easily concealed, these weapons can pass undetected and are the perfect weapon for a kill that won't draw a lot of attention. Taking a cue from the sports world, thugs have been known recently to wield these long sturdy hockey sticks to take a whack at more than just pucks. Easily passed off as just a sports fan's favorite piece of memorabilia, these hockey sticks can get you more than just a few minutes in the penalty box if you're caught using it for "illegal roughage". Once the weapons of the noble samurai in ancient Japan, the local Yakuza has decided to �keep it real� and turn many of their enemies into thinly sliced sashimi with these long, razor sharp swords. Light, compact and dependable, this Austrian engineered Pistol is the perfect sidearm for any made man the go. A new arrival in Liberty City, the Pistol has won many awards for its performance and sleek design. This Semi Automatic Shotgun is one of the fiercest shotguns on the market. Originally used by the SWAT teams and police forces to control riots and handle major situations, this semi-automatic rifles heavy and can deliver powerful loads of buckshot in quick succession. An extremely dangerous tool in the ongoing Family Wars of Liberty City, the government is looking the ban this rifle altogether. This light weight version of the M-16, is capable of a firing rate of 700-1,000 rounds a minute. Once a standard weapon of the US Special Forced, the M4 has quickly become very popular among Liberty Cities Elite Mafia soldiers capable of taking out multiple targets and shredding unarmored cars in a matter of seconds. The flamethrower is certainly one of the most visceral and intimidating weapons ever devised by man. Shooting a thirty-foot column of flaming fuel, the flame thrower can create long lasting fires that burn well after you've made your escape, engulfing everything and anything nearby in searing hot flames. Originally developed for use mounted on military helicopters, this devastating weapon was popularized by the movie "Predator" in 1987. It has electrically-driven rotating barrels and an absolutely incredibly high rate of fire when maxed to its full potential and is capable of mowing down everything in path in hail of bullets. With great power however, comes, a price. The minigun is extremely heavy and difficult to wield, making it fairly impractical to tote around on a regular basis and thus a rare find in Liberty City. Light and strong, the machete has is popular in Liberty City chiefly among gangs like the Columbian Cartels and the Chinese Triads. Many a pour soul has found himself the recipient of an unwanted �Columbian Necktie� from the wrong side of these razor sharp longknives. Few things strike fear into the heart of Liberty City�s underworld population like the sound of a revving chainsaw. Since Liberty City doesn�t have much of a logging industry, the sound of the titanium chainsaw blades can only mean an unpleasant demise is close at hand. Feeling lucky punk? These powerful hand cannon�s are difficult to wield but pack a tremendous amount of firepower. Often used for hunting big game, one shot from this high velocity monster can take down even the biggest body-armor wearing tough guy from a great distance. Originally developed for the Soviet Army in the late 40�s and early 50�s this automatic rifle can produce a high volume of fire and is fairly simple to maintain. The AK has evolved into a favorite among everyone from ghetto gangbangers of San Andreas to the elite made men of the Liberty City mafia. This re-loadable, shoulder-fired, recoilless grenade launcher has recently become the bane of many a police chopper and SWAT van in Liberty City. Designed as an anti-tank weapon, this devastating weapon is capable of massive amounts of damage in one shot and has an optical sight for more precise targeting. The ultimate in stealth assassination, the laser scoped sniper rifle is able to take out a target with pinpoint precision from several hundred yards without the shooter ever being noticed. Many of Liberty City�s underworld has met their maker with a bolt the head from this sleek, silent killer.